As more cities envision their waterfronts as lively public destinations that keep people coming back, PPS outlines the following principles to make that happen. They are not all hard and fast laws, but rules of thumb drawn from 32 years of experience working to improve urban waterfronts around the world. These ideas can serve as the framework for any waterfront project seeking to create vibrant public spaces, and, by extension, a vibrant city. 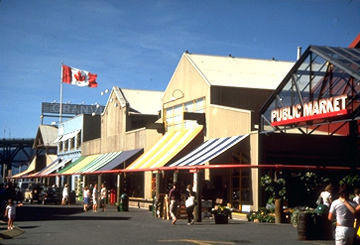 The public market at Vancouver's Granville Island. The best solutions for waterfronts put public goals first, not short-term financial expediency. As long as plans adhere to the notion that the waterfront is an inherently public asset, then many of the following steps can be pursued successfully. Community engagement -- and, ultimately, local ownership and pride -- will flow from this basic premise. 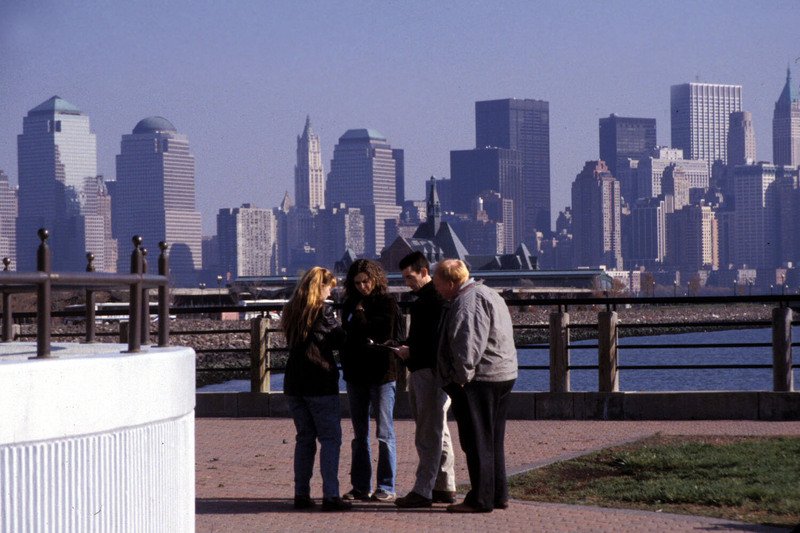 Residents use PPS's Place Game to envision improvements to Liberty State Park in Jersey City, New Jersey. Unlike a master plan, a vision process does not lock a project into a prescribed solution. It is a citizen-led initiative that outlines a set of goals--ideals to strive for--that set the stage for people to think boldly, make breakthroughs, and achieve new possibilities for their waterfront. Because a vision is adaptable and can be implemented gradually, starting with small experiments, it often becomes bolder as public enthusiasm for making changes builds and the transformation of the waterfront gains credibility. 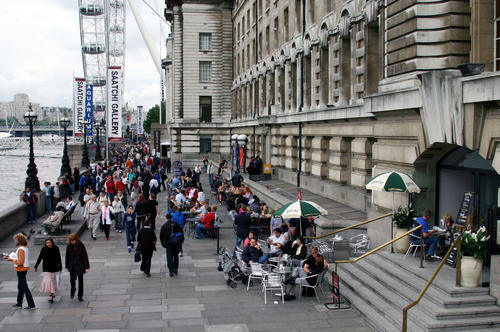 The wealth of uses around the London Eye has created a destination where there was none before. PPS has found that an effective way to structure a vision process is to set a goal of creating ten great destinations along the entire waterfront, an idea we call the "Power of Ten." This focus on destinations, rather than "open space" or parks, enables a genuine community-led process to take root. Once ten destinations have been identified, then nearby residents, businesses, community organizations and other stakeholders begin to define the uses and activities they want to see at each place. Ideally, each destination should provide ten things to do, which creates diverse, layered activity, ensuring that no single use will predominate. This process is open-ended--so that the result can fulfill the hopes of people involved in the process. This cannot happen when it is assumed from the outset that the goal is to build, say, a park, which may narrow the range of possible outcomes and prevent some of the best ideas from ever seeing the light of day. 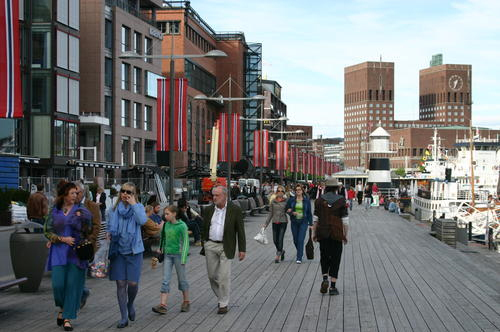 Helsinki's Esplanade provides an exceptional connection between the city center and the waterfront. The next idea to keep in mind is that each of the ten destinations should be incorporated into a vision for the waterfront as a whole. 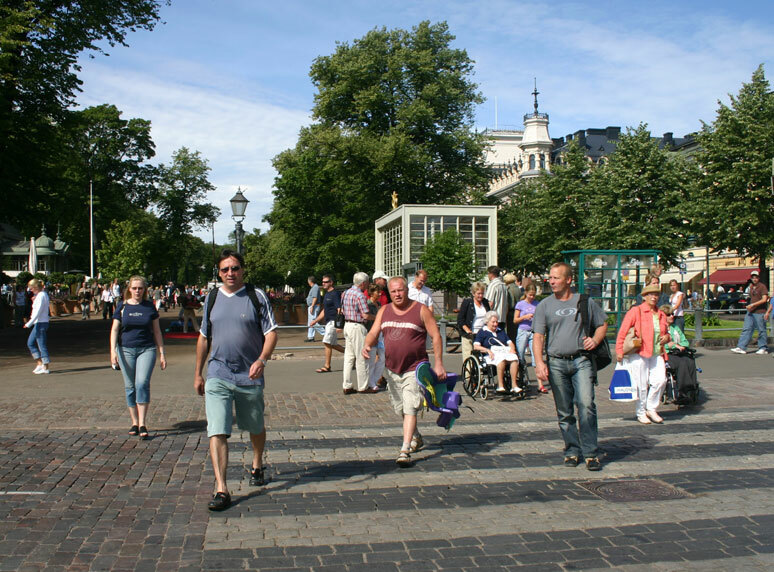 The key is to achieve continuity, especially when it comes to the pedestrian experience. 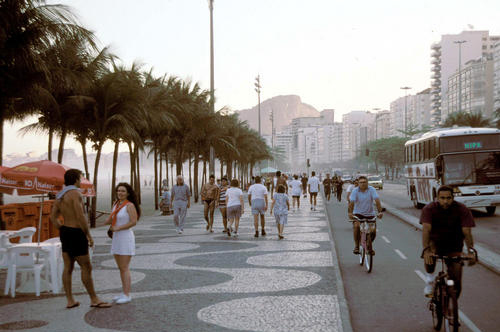 A walkable waterfront with a wide variety of activity along it will successfully connect destinations, allowing each to strengthen the others. Creating these connections is a fascinating challenge that entails mixing uses (such as housing, parks, entertainment and retail) and mixing partners (such as public institutions and local business owners). 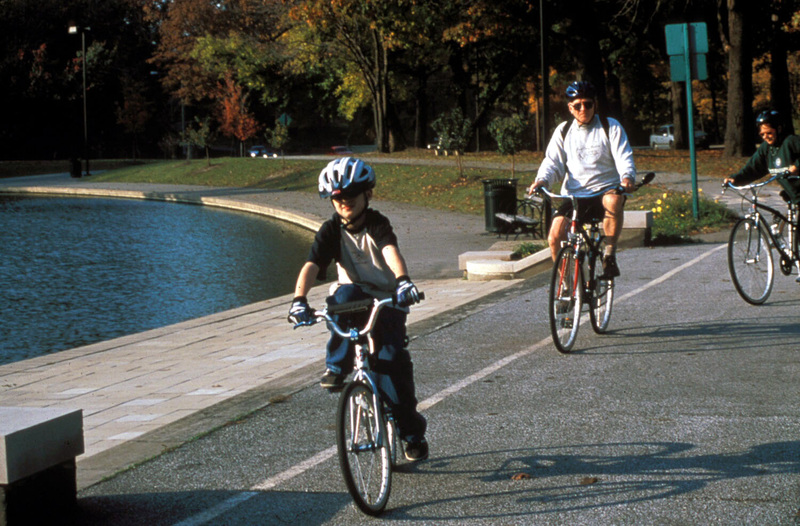 Creating connections also means enticing people to the waterfront on foot or bike, rather than relying exclusively on the car. Helsinki, Finland, possesses perhaps the best example of this kind of connection--The Esplanade, which masterfully leads from the heart of the city down to the water. Lined with trees and flower displays, the path is a gentle lure, rewarding us with a magnificent plaza with sweeping, unobstructed views of the harbor. It guides you on a pleasurable stroll straight to the waterfront's main destination. 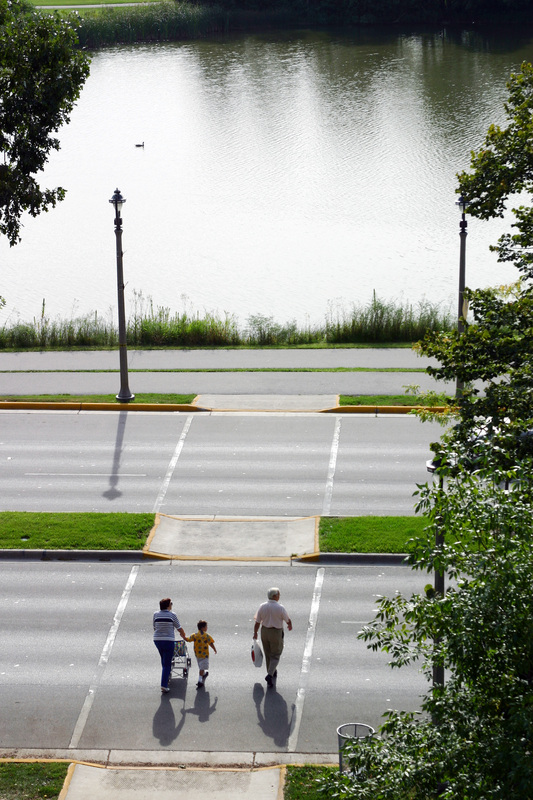 Pedestrian crossings enhance access to the water in Milwaukee, Wisconsin. 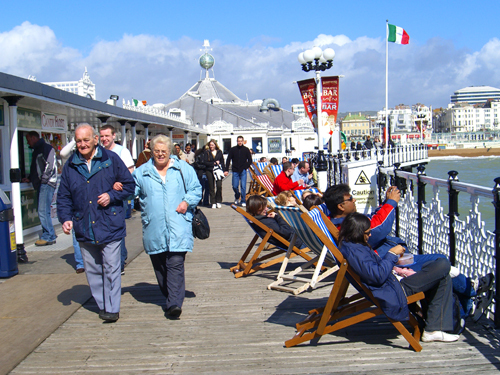 It is essential that the waterfront be accessible for people's use to the greatest extent possible. Once again, the goal of continuity is of paramount importance. Waterfronts with continuous public access are much more desirable than those where the public space is interrupted. Even small stretches where the waterfront is unavailable to the public greatly diminish the experience. California's Balboa Island, located off the coast of Newport Beach, makes its entire shoreline accessible to the public instead of giving waterfront property owners sole rights of use. Access also means that people can actually interact with the water in many ways--from swimming or fishing, dining or picnicking dockside, boarding boats or feeding the ducks. If it is not possible to actually touch the water, people should have access to another type of water nearby--such as a fountain, spray play area or a swimming pool that floats next to the shore (such as the pools in the Seine during Paris Plage). When the public's vision comes first in a waterfront revitalization project, new developments can be tailored to meet the community's shared goals and expectations. Waterfronts are too valuable to simply allow developers to dictate the terms of growth and change. This is not to say that private development should be unwelcome or discouraged -- on the contrary, it is necessary to the future of a healthy waterfront. But whatever is built must contribute to the goals set forth by the community, not detract from them. And, of course, development should never interfere with pedestrian connections, making parking lots and auto-oriented development out of the question. Great waterfronts are not dominated by residential development. Why? Because these are places that are full of people, day and night. They are the sites of festivals, markets, fireworks displays, concerts and other high-energy gatherings. A high concentration of residential development limits the diversity of waterfront use and creates constituencies invested in preventing 24-hour activity from flourishing. In a similar vein, parks should not serve as the raison d'être of the entire waterfront. 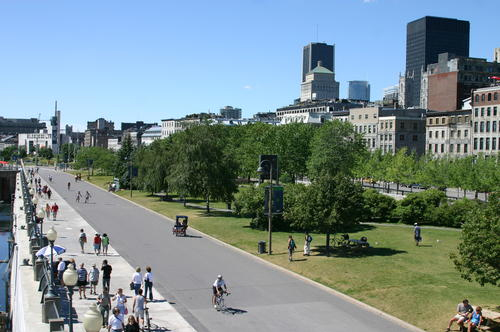 Passive open space puts a damper on the inherent vibrancy of waterfronts, evident in cities such as New York, Vancouver, and Toronto that have relied too heavily on "greening" their waterfronts without mixing uses that draw people for different reasons at different times. The world's best waterfronts use parks as connective tissue, using them to link major destinations together. Helsinki, Stockholm, Sydney, and Baltimore have employed this strategy to fine effect. Any building on the waterfront should add to the activity of the public spaces around it. When successful, the result is an ideal combination of commercial and public uses. Towers, on the other hand, are noticeably out of place along rivers, lakes and oceanfronts. High-rises tend to be residential buildings with private activity on the ground floor. They may also create a wall that physically and psychologically cuts off the waterfront from surrounding neighborhoods. Rain or cold is no reason for a waterfront to sit empty. Indeed coastal and lakefront places are often known for their chilly winds and gray skies. Waterfront programming should take rainy-day and winter activities into account, and amenities should provide protection from inclement weather. Waterfronts that can thrive in year-round conditions will reap the benefits of greater economic activity and higher attendance at public facilities. An iconic structure can be a boon to the waterfront, so long as it acts as a multi-use destination. 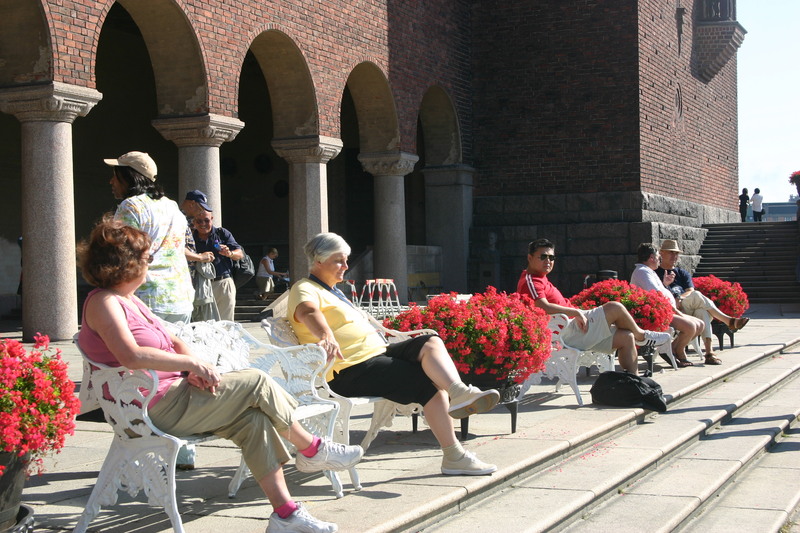 On a recent weekend morning in Stockholm, the busiest building along the waterfront was the City Hall. Surrounded by a plaza, park, and courtyards, the building shares its slice of the waterfront with a major pier where boats offer waterfront tours. Clearly, this City Hall is more than a one-dimensional icon, it is also a good neighbor with a strong sense of place. Today's icons should strive to achieve the same flexibility and public-spirited presence. 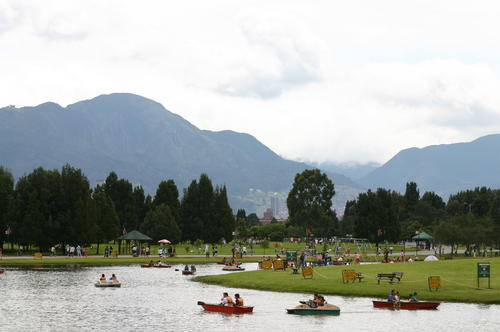 Bogota's Simon Bolivar park is very well managed, with uses and programs on and off the water. 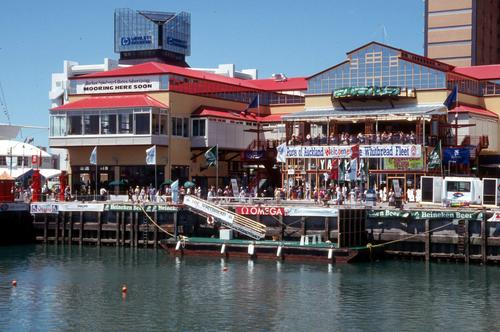 Ongoing management is essential to maintain waterfronts and sustain a diverse variety of activities and events throughout the year. Waterfronts could adopt the model of the Business Improvement Districts that have been so successful in many downtowns. A "WID" could forge partnerships between waterfront businesses and organizations and those in the surrounding district, so that waterfront programming--such as temporary exhibits of local artists or music by local musicians--reflects the community and gives the place a unique character.